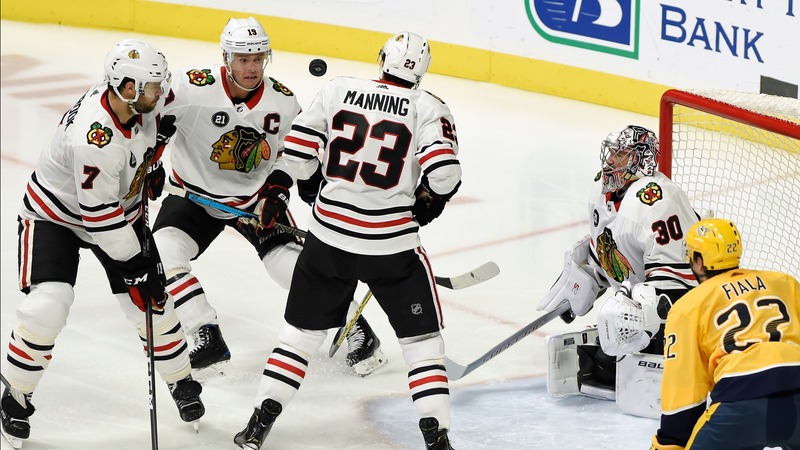 The Chicago Blackhawks will have to start thinking about how to get their prospects involved and attaining assets if they play like this for much longer. Acknowledging when it's time to pack things in and start over from scratch can be hard when it doesn't seem that long ago at all that you built your dynasty in the first place. However, that's where the Chicago Blackhawks are starting to find themselves 27 games into the 2018-19 NHL season and a Blackhawks rebuild feel imminent. On Saturday night against the division-leading Predators, the Blackhawks were once again punched in the mouth early. First figuratively with a trio of goals allowed in just over four minutes and then more literally when Duncan Keith took [a big shot](https://chicago.suntimes.com/sports/duncan-keith-blackhawks-miikka-salomaki-predators/) on the boards and took a game misconduct defending himself. <a href="https://twitter.com/NBCSBlackhawks/status/1069040934086737920" class="embedly-card" data-card-width="100%" data-card-controls="0">Embedded content: https://twitter.com/NBCSBlackhawks/status/1069040934086737920</a> Chicago showed some fight (this time they went literal first and figurative second), battling back to 4-2 and earning some solid looks in the fourth quarter to inch closer. However, the Predators would add an empty-netter to earn a 5-2 win that leaves the Blackhawks at 9-13-5. Now, they're in a position where they're looking bad and playing worse with the future casting an odd shadow like a giant question mark. __Play to win:__ [Enter our free daily contests to win great prizes and even cash! ](https://betchicago.chalkline.com/) For such a long time, it felt like the Blackhawks were well ahead of the curve. They locked their core into long-term deals and used the mid and late rounds of the draft to unearth capable NHL talent that could supplement their stars and help them avoid the salary cap problems that plague teams built from the ground up. In hindsight, we can see now that the end may have been coming a while before last year's last-place finish in the division and the extension of all those issues this year. Following their last Stanley Cup in 2015, the the Blackhawks were bounced from the playoffs in the first round twice in a row. But blinded by 103 and 109-point regular seasons in those respective campaigns, the assumption was that their title window was still wide open. Until all of a sudden it wasn't. Age and the inability to continually replace quality role players who earned larger roles and bigger contracts with other clubs caught the Blackhawks in a hurry. And Chicago is running out of time to get out in front of things again and do what they can to open a new window. The contracts of Jonathan Toews, Patrick Kane, Duncan Keith and Brent Seabrook limit what the organization can do to build a new core. However, what they can do is begin building a new supporting cast. But that has to start very soon. The Blackhawks farm system isn't stacked, but they've got some pieces worth being optimistic about. Henri Jokiharju has been one of the bright spots on defense this season and the Blackhawks have several other blue-line prospects with the potential to help rebuild that unit in the next few seasons. There's also some forwards on the precipice of NHL ready. In fact, most thought that Dylan Sikura and Victor Ejdsell had really good chances to break camp with the big club. Instead, both have been in Rockford and seem like they could be useful additions to forward lines that haven't gotten a lot of production from their bottom nine. However, assuming that alone will make the Blackhawks whole again is what got the Blackhawks in this mess in the first place. The Blackhawks had the money this offseason to make either a big free-agency signing or a splashy trade acquisition, but they did neither. And even with reports that they couldn't find takers in free agency and that asking prices were too high on the trade market, that's not an excuse. They can't afford to make that mistake again. They're relatively healthy at the moment and barring any major developments in the next couple weeks that put the Blackhawks back in the thick of the division race, they've got to take advantage of that by shopping anybody they can find a taker for. The expiring contracts like Marcus Kruger, Chris Kunitz and Jan Rutta are the no-brainers. They're not worth much, but if you can get any value for them you have to take it. In doing so, you accomplish two things at once, turning what will turn into nothing during the offseason into an asset and clearing space for prospect development. The more difficult decisions will come on the players who have multiple years left on their contracts or who are entering a period of limited control. Artem Anisimov and Brandon Saad can still be useful players, but haven't lived up to their current contracts and you have to consider moving them in lieu of the right offer. Nick Schmaltz had looked like he might be the most difficult decision with the deadline approaching. At one point, he looked like he was another strong season away from a big contract in the offseason, but two months of struggles brought that into question. With the Blackhawks starting to feel desperate again after the Joel Quenneville firing and Jeremy Colliton promotion yielded [little change](https://www.betchicago.com/blackhawks-statistical-gains-coaching-change), they sent Schmaltz to the Coyotes in exchange for two former first-round picks last Sunday. Dylan Strome and Brendan Perlini will provide added forward depth for the immediate future, but they're primarily [long-term plays](https://www.betchicago.com/nick-schmaltz-trade-blackhawks-signals-something) at 21 and 22 years of age, respectively. The Blackhawks also have the cap space to park a (somewhat) bad contract. So long as it's temporary and they can get a worthwhile asset in return, it would be a wise play with little use for the cap space the remainder of this season anyways. If they can do some combination of a couple of these things (check the Schmaltz box) or even all these things, they can start stockpiling draft picks or maybe even closer-to-ready NHL prospects to begin the overhaul. As painful as that process might be given the success the Blackhawks have had in the last decade, you can be sure that the alternative is even more painful. Because if there's one thing that's clear during their struggles this season, it's that this is no fluke. Blackhawks opponents [regularly get](https://www.naturalstattrick.com/games.php?team=CHI) higher-quality scoring looks and a larger quantity of scoring looks. That's not the case for good teams who are getting unlucky. Which leaves us with the conclusion that this just isn't a good team anymore and there isn't a quick fix in sight. So the sooner you start the rebuild, the better.